Previous Occupation: From 1958- 1960, she practiced law in Maryvale, Arizona, and served as Assistant Attorney General of Arizona from 1965-1969. She was appointed to the Arizona State Senate in 1969 and was subsequently reelected to two two-year terms. Previous Office: In 1975 she was elected Judge of the Maricopa County Superior Court and served until 1979, when she was appointed to the Arizona Court of Appeals. President Reagan nominated her, and she took her seat September 25, 1981. Education: She received her B.A. and LL.B. from Stanford University. Spouse: She married John Jay O' Connor III in 1952 and has three sons-Scott, Brian, and Jay. Click here for The Forum discussion on Sandra Day O'Connor. 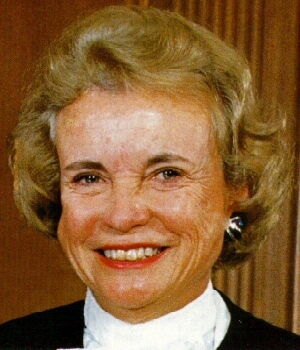 Click here for VoteMatch responses by Sandra Day O'Connor.